Volkswagen is ending production of its iconic Beetle, closing the door on one of the world’s most famous car brands. Sales, particularly in the key US market, have fallen in recent years. Consumers have increasingly turned to larger cars such as crossovers and sports utility vehicles. But Volkswagen, in the wake of the diesel emissions scandal and huge investment in electric vehicles, has also been looking to slim down its model range. Beetle was created in 1938 by legendary engineer Ferdinand Porsche – a name now synonymous with fast cars – at the behest of Adolf Hitler, who wanted to see a cheap and practical mass-produced car made available to the German people. But the marque found global fame in the 1960s and ’70s as Herbie the Love Bug, a racing car with a mind of its own. It was also popular with the 1960s counter-culture, who extolled the Beetle’s small, practical, but aesthetic qualities. 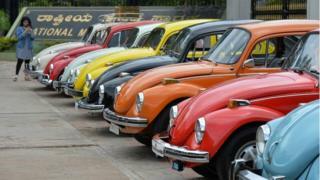 Production of the Beetle has ceased, and then been revived, several times over the decades. And Mr Woebcken didn’t completely rule out that the model could one day be resurrected. “Never say never,” he said. But the company is already thought to have reviewed a possible model revamp and options for electric versions. Volkswagen sold 11,151 Beetles during the first eight months of 2018, down 2.2% from the same period a year earlier. US consumers looking for a small Volkswagen vehicle overwhelmingly prefer the Jetta sedan, or a Tiguan compact sport utility vehicle.